Saw Palmetto plant, Serenoa repens, is sometimes known as Palm Cabbage. Saw Palmetto yields berries that are well known for their nutritional and prostate tonifying effects. The succulent fruit is eaten as tonic or made into syrup for convalescents – benefits the mucous membrane. The growing bud used as vegetable and as a bedtime tea. Showy fan shaped leaves used for weaving. 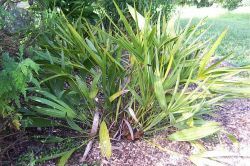 Saw Palmetto plant is a native of Central America and is adaptable to any well drained soil in a protected sunny position. Fruit are dark purple to black olive like berries ripening in early winter. Drought and frost tender – will tolerate a light frost. An evergreen plant, growing to 2m x 2m. Be the first to review “Saw Palmetto, plant” Click here to cancel reply.